Over the last couple of weeks, there’s been a bit of hype around Quentin Tarantino’s latest flick, Django Unchained. His films usually generate lots of talk and debate and after seeing interviews with both Jamie Foxx and Quentin himself on The Graham Norton Show earlier in the month, I had added it to my ‘if I get to the movies soon’ list – which actually turned out to be yesterday afternoon. Jamie Foxx stars as Django, a slave in America’s Deep South who finds himself in the company of garrulous German dentist/bounty hunter, Dr. King Schultz (played by the fabulous Christoph Waltz). The movie follows the unlikely duo as they criss-cross the country pursuing the Wanted and making a tidy sum before reaching Candyland, home to Leonardo DiCaprio’s Calvin Candie (and his outrageously outspoken manservant Stephen, played by Samuel L Jackson) in search of Django’s wife, Broomhilda. 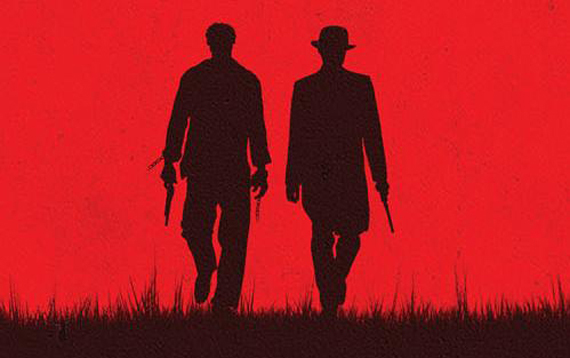 Foxx’s Django is the movie’s intense and brooding centrepiece around which the cast create their stories. DiCaprio layers smooth Southern charm over Candie’s snake-like cruelty and the ridiculous capriciousness befitting the insanely rich and powerful white man who cannot imagine not getting exactly what he wants. Jackson’s ornery and indignant Stephen is the perfect foil for Candie dangerous charm and even Don Johnson’s (remember Miami Vice?) Big Daddy exemplifies the greedy, ignorant and unworldly white men who owned the populations and plantations of the Deep South. It’s an amazing cast with extraordinary performances but for me the star of the show was Waltz. Since seeing his chilling performance in Inglourious Basterds, I’ve been intrigued by this relative ‘unknown’ and while this character is a far cry from Colonel Hans Landa, his performance was every bit as mesmerising. Frivolous yet pragmatic, in his portrayal of Dr. Schultz Waltz captured the spirit of Tarantino – his passion for crafting his vision, his ability to tell a story without resorting to the esoteric or high-brow (let’s face it, there is never anything high-brow about a Tarantino flick), his ability to give his cast the space to ‘play’ with their characters and his unadulterated joy in simply making movies. The film pays homage to the Spaghetti Western genre of the 1960s and is typically Tarantino – irreverent, unapologetically gory and in-your-face. It’s also on the long side (160+ minutes) and there are a few scenes that ‘don’t work’ towards the end but it is full of typical Tarantino moments and remarkable performances. A great way to spend a chilly, grey Saturday afternoon! This entry was posted in Expat moments, Inspired by, Life in the UK and tagged Christoph Waltz, Django Unchained, Life in the UK, Quentin Tarantino, spaghetti western by Kym Hamer. Bookmark the permalink.